You might describe this garment as a “red kimono,” but it is more accurately called shitagi, meaning under layer, worn under uwagi, meaning top layer. The set worn together was called kasane, meaning layered. Most of the shitagi was hidden from view. Kasane in sets of two to three were worn in the later Edo and Meiji Periods, 100 to 150 years ago. Layering of robes or colors is important in Japanese aesthetics. In the Heian Period, some noble ladies wore up to 25 layers of silk robes. In Japan, for the past several hundred years, material dyed crimson with the petals of safflower, Carthamus tinctorius (benibana) has spoken of money. The petals, laborious to extract are costly; a Japanese proverb affirms, “A pound of beni is worth a pound of gold.” In addition, safflower petals have medicinal uses, most importantly for blood circulation, associated with women’s monthly cycles. Since the Heian period (794–1185 CE) fabrics dyed with safflower red have been worn close to the skin to evoke spiritual and physical healing. Shades of red also evoke love, heroism, passion, and the feminine and continue to enrich the vocabulary of fashion and design. Used sparingly to decorate women in the blush of youth, after marriage these shades of passionate red appear only in undergarments and serve as a hidden affirmation of life. As a child, I was surprised to see a bright red and white under-kimono as my mother removed layers of kimono and sashes. Safflower petals can produce a range of color from burning sun red on silk to neon pink on ramie, but the dye is fugitive, which adds another layer of meaning to the Japanese aesthetic of ephemerality. 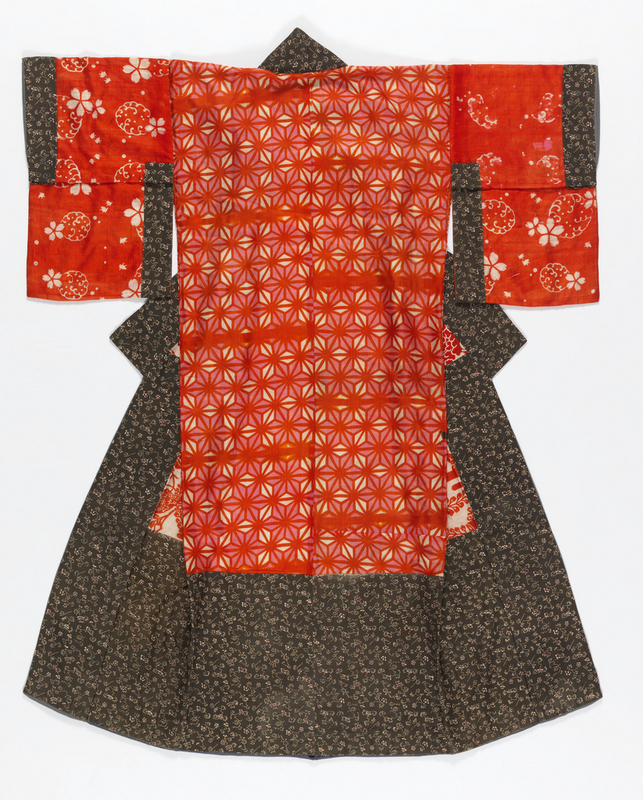 The under-kimono pictured here is dated 1900–1950. By then natural dyes had been replaced by chemical dyes, which were less costly and more color fast, but the term “beni” continued to be used for the color red. To imagine how this shitagi would look if dyed with natural benibana, see Nippon Colours: The Japanese Art of Kasuki-zome, also in the museum’s collection. The left side shows silk threads dyed with naturally derived beni. The garment is made of lightweight silk. The four fabrics that face the edges are resist-dyed with red using the itajime shibori process, in which a folded fabric is pressed between boards, the two faces of which are carved with the mirrored patterns. Holes in the board and carved areas in the design allow for the passage of dye. Among the four patterns, a six-pointed star grid in two shades of red and white is called Asa-no-ha, hemp leaf; it was a symbol of robust growth and health. Yamagata in northern Japan is the region where safflower flowers are grown and the red petals are made into patties (beni-mochi) that were historically transported to Kyoto to be made into rouge or used for dyeing textile, such as the traditional “beni-itajime shibori.” In response to local community and university efforts to continue the centuries-old tradition, the 11th International Shibori Symposium, 2018, will hold events in Yamagata. Yoshiko Iwamoto Wada is an artist, author, curator, historian, and educator with expertise in Japanese textile arts.